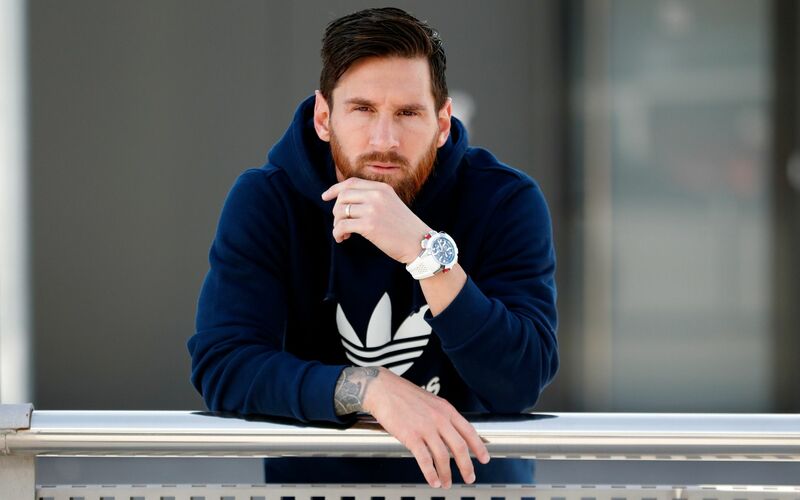 Football icon Lionel Messi takes a turn at designing watches in his first collaboration with Jacob & Co.
Jacob & Co. has signed a three-year partnership with Lionel Messi, promising numerous special editions celebrating the professional accomplishments of the brilliant footballer. For Messi, who was awarded his fifth Golden Shoe for scoring the most goals in Europe last season, breaking his tie with Cristiano Ronaldo, working with Jacob & Co. is an immense honour: “I regard the company as the most innovative watchmaker.” In the first release out of this collaboration, Messi brings white heat to the Epic X Chrono sport model, a limited edition of 180 pieces. The front profile of the Epic X Chrono "Messi"
Apart from the 47mm titanium case, everything else is either white or blue, alluding to the flag colours of Argentina, Messi’s home country. The bezel and chronograph pushers are white ceramic, the horns have blue rubber inserts and the strap is white rubber. Red rubber crowns, however, break the cool tones. Who Are You Rooting For To Win The FIFA World Cup 2018? Messi had his jersey number, ‘10’, emblazoned on the flange in red. A stylised ‘M’ takes pride of place at ‘6’, right above his surname. His signature looks incredibly chic against the blue sapphire caseback, the latter’s transparency offering a peek at the beautifully decorated skeleton bi-compax chronograph movement. The automatic calibre features an anthracite rotor with red lacquered engraving of “Jacob & Co Geneve”. With the partnership now in full swing, Jacob & Co. has already teased the next watch, an interpretation of the Epic SF24 Tourbillon that features the novel Split Flap second time zone. Messi wore this watch to last month’s European Golden Shoe Gala.